What do you do when you have a free morning, but the rest of your day is busy? For the two of us the Shag Bay Track looked a good choice, given it’s one of the shortest walks along the Derwent. But if we were expecting the walk to be short on interest, we soon found otherwise. It may be less than 2km long (each way), but this walk packs a great deal into a short distance. 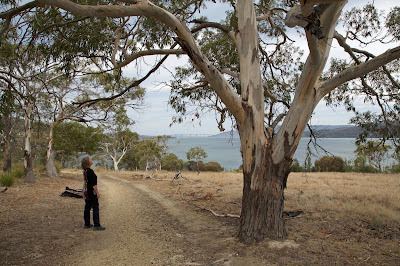 We parked at the start, in suburban Geilston Bay, on Hobart's Eastern Shore, and walked up a well-marked and easy track. Through the sparse trees we looked out at dozens of colourful yachts that bobbed at anchor in sheltered Koomela Bay. Just a few minutes up the track we started to get broader views across the Derwent. To the south the Tasman Bridge, almost side on, looked particularly impressive. 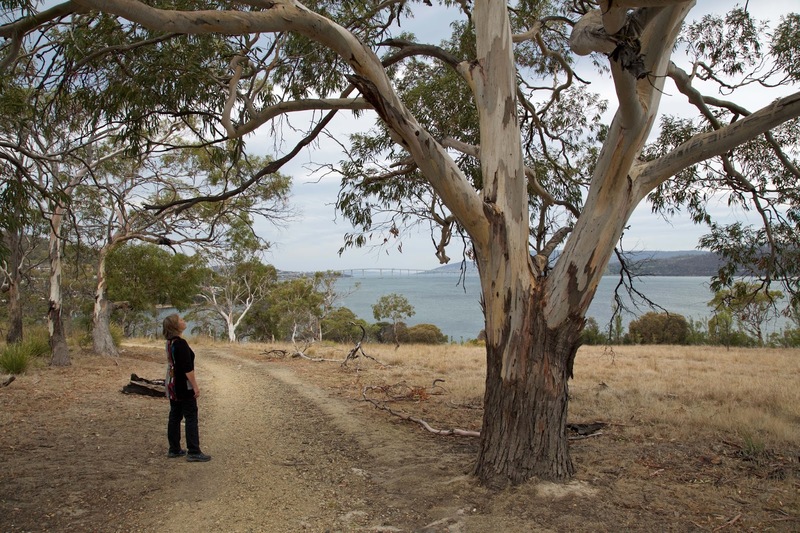 To the west we had glimpses of the Royal Tasmanian Botanical Gardens, its exotic and deciduous trees a contrast to the muted colours of the drier Eastern Shore bushland. As we turned north we could hear and see the Nyrstar Zinc Works across the Derwent. 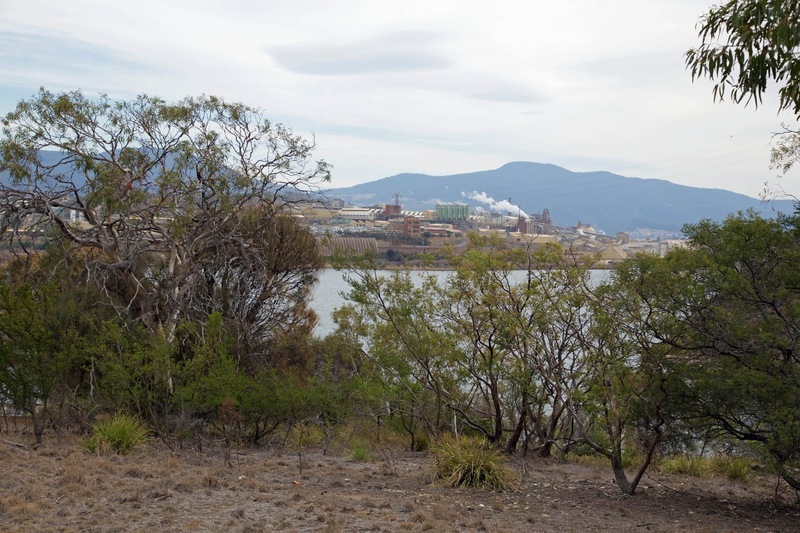 For nearly 100 years the factory has processed minerals from Tasmania and beyond, turning them into zinc for use in galvanising. If a century old factory seemed ancient, we were in for a surprise when we got down to Shag Bay itself. 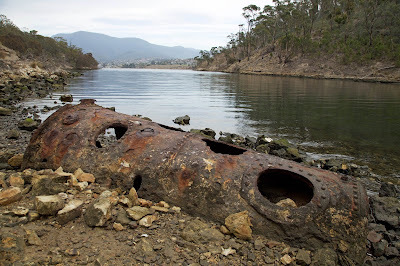 A steepish track led us to the narrow, bush-enclosed bay, where we found remnants of old industry, including a rusty boiler. Shag Bay was once the site of a mill that transformed bones into fertiliser. But it was also the scene of a tragedy. A high-pressure boiler exploded in 1915 killing two workers and destroying the factory. Today’s peaceful setting seemed at odds with that sad story. We soon found a far deeper story. Aboriginal middens, with shell and bone fragments from thousands of years of food gathering, still sat there alongside recent industrial ruins. 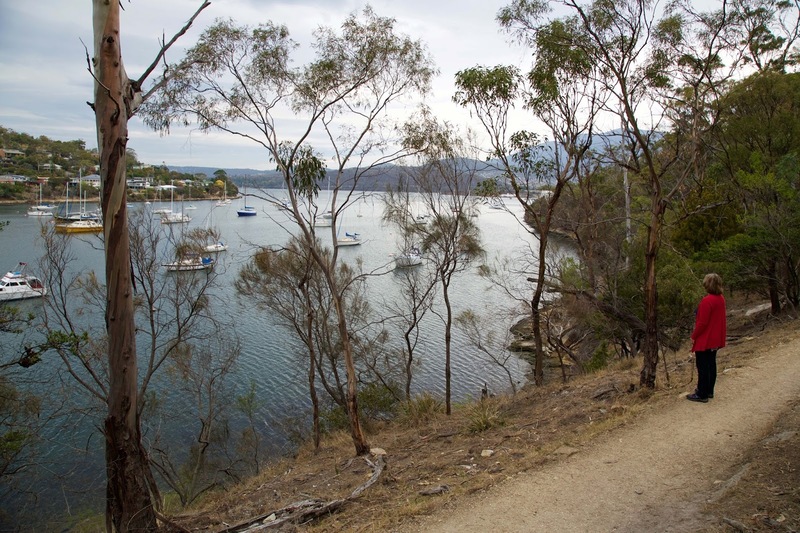 Given the whole area’s panoramic setting, its proximity to the shortest crossing point of the lower Derwent, and its access to rich marine resources, we weren’t surprise that it was favoured by Aboriginal groups. 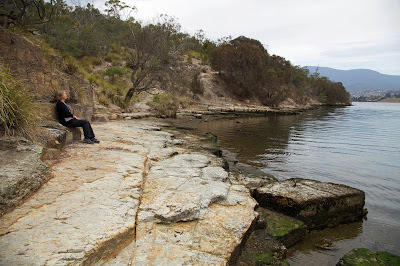 We sat awhile to contemplate the many generations of Aboriginal people who must have known and loved this place. Their long history was changed forever by the arrival of Europeans in 1803. 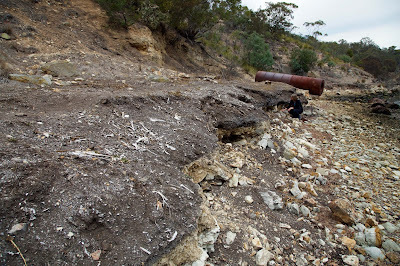 The first British settlement at Risdon Cove, only a short walk from Shag Bay, was also the site of the first violent Aboriginal deaths. With our minds full of deep time and sad stories, we were quiet on the return walk. As we ambled slowly down the track, it took the sharp call of some honeyeaters to bring us back to the present. We soon found ourselves back in yacht-dotted Geilston Bay. We were surprised it had taken us barely an hour to do a walk that truly spans thousands of years of history.